When you require transfer service between Narita Airport and downtown Tokyo based on seat in coach, we do suggest you to buy the Limousine Pass coupon. You can ride comfortably from Narita Airport to Tokyo City Air Terminal, Tokyo Station, Haneda Airport or 71 major hotels in Tokyo. 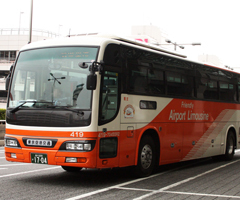 You can also use the Limousine Pass from the above places of downtown Tokyo to Narita Airport. Please present QR code or verification number to get the physical ticket in below service counter. *Ticket is not refundable or changeable once issued.